When it’s nice weather for ducks outside, head straight for the shower with this lemon jelly. Inside, a citrus explosion of fresh organic lemon infusion, lemon oil and organic lemon myrtle will blow the blues away. Why not take your jelly straight out of the fridge or freezer and into the bath or shower with you? The rush of cold on your skin will send blood pumping to the surface, increasing circulation and delivering a super-refreshed feeling. This is not too sweet. It smells like real lemons. 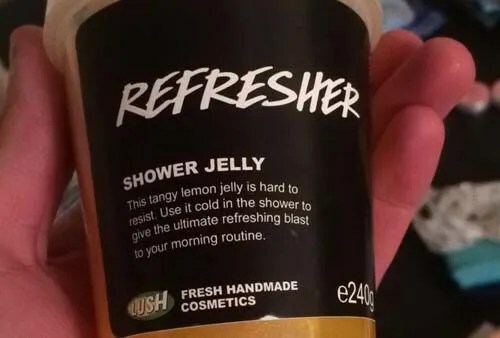 Posted on September 18, 2015 by Lushalot	• This entry was posted in Jellies, Lush Oxford Street store exclusives, New and tagged lemon jelly, New, new jelly, new lush jellies, refresher jelly. Bookmark the permalink.